Sean Dyche insists that he’s happy with the balance of his side ahead of the final stretch of the Championship season. 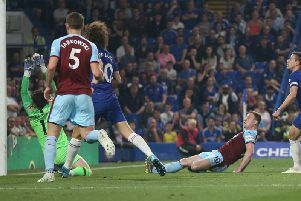 The Burnley boss believes the Clarets could even be in better shape than when the club finished second in the division in the 2013/14 campaign, ultimately gaining promotion to the top flight. Two years ago the Clarets had been heavily reliant on Danny Ings and Sam Vokes to find the net, with the strike duo contributing 65% of the goals that term. However, the goals have been well distributed this term with record signing Andre Gray and Vokes only responsible for 46% of Burnley’s tally with 10 other scorers getting in on the action. “I think we’ve got a few players,” said Dyche. “We’ve certainly got a lot to offer as a team. “If you look at the goal tally this season, two years ago when we went up I think our goal tally was 79 per cent at this stage I think of goals from centre forwards, this season it’s about 48, so we’ve got a lot of players scoring from all areas of the pitch. “That is the hardest part of the game, we all know that, that’s why strikers are worth bags full of money because that’s the hardest job. On his strikers, Dyche added: “I was a centre half, I believe the most affective way of playing is to have two strikers, or a version of it - one dropping off, one dropping in, playing in between. I just think it’s effective. Dyche’s attempts to land another attacking option were scuppered when Spurs winger Alex Pritchard opted to join Premier League side West Brom. The Clarets had been hopeful of landing the 22-year-old, who was included in last season’s Championship PFA team of the year following his loan spell at Brentford, but Tony Pulis’s late interest prompted a turnaround. The Clarets are hopeful of sealing a deal for Bees defender James Tarkowski today ahead of the deadline. The 23-year-old, disciplined at Griffin Park after telling manager Dean Smith that he wished to play no part in the game against the Clarets earlier in the month, had expressed a desire to return north to be nearer to his family as his mother has an incurable illness. The former Oldham man, who has appeared 23 times this term, was expected to seal a move for a fee believed to be in the region of £3m after passing a medical at the club.